Identifying and recruiting highly qualified IT professionals with high-demand skillsets is one of the biggest challenges for a staffing company. With the current climate of low unemployment rates, a growing gap in skills-sets, and companies in need of IT talent for their critical projects as soon as possible, how can a staffing company ensure their clients are getting high-caliber consultants? An industry best practice is to develop an active referral program. By leveraging current consultants’ networks and rewarding them to help source high-level talent, a referral program can become one of the most valuable tools in your recruiting arsenal. For all of the money and effort spent on sourcing consultants, a company’s best resource for identifying new rock stars are their current rock stars. And in staffing, that means good old-fashioned word of mouth recommendations. As Tools of Titans author Tim Ferriss says, “You are the average of the five people you most associate with.” When the consultant that is well liked and performs exceptionally well chooses to refer a new candidate to their company or encourage “the five people they most associate with” to come aboard, they elevate the overall talent that is being added to the talent pool. And each then becomes a brand ambassador in a growing network of rock stars. The best talent the company has reaches out to their like-minded and equally talented network, and it doesn’t get more effective than that. There is no better or more genuine way than a robust referral program to provide a client with talent, and simultaneously promote the organization as an employer of choice. Speed-to-hire is always critical for companies with project deadlines and the need for high-demand skills to complete them. 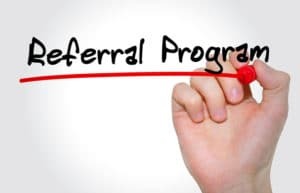 Companies that have strong referral programs in place stand apart in a competitive market because they are able to eliminate many of the initial steps in the recruiting process when they work with referrals and this accelerates the time needed to fill positions. Another factor that helps eliminate steps in the process is that consultants that are referred to a company are generally ready to accept an offer and hit the ground running. They have already made the choice to pursue an opportunity based on the information that the current consultant (referee) has provided them. Some of the best candidates for a job aren’t necessarily looking for the next opportunity because they are already employed. These “passive” candidates are not usually found on job boards so when they are submitted to a company through their referral program, the company isn’t competing with every other company that is using job boards to recruit them. The race to find the best candidate and guide them through the interview process is eliminated as is the risk of losing that candidate to a competing opportunity that was able to make an offer first. When considering the best staffing company to partner with, there is no doubt that companies should evaluate whether or not there is a strong and active referral program in place. The benefits of working with companies that value their current consultants enough to engage and reward them for bringing in highly-qualified talent from their networks are numerous and the results will help the hiring companies to not only achieve their project goals but also contribute greatly to their bottom line. Make sure to connect with a Matlen Silver recruiter or go to our website if you want to learn more about our fantastic Matlen Silver Referral Program. Sources: Materials provided by Society for Human Resource Management, Tech.co, Bureau of Labor Statistics.